My colleagues at work know that I love to eat oysters. I enjoy them raw, but fried or grilled oysters are tasty too. A light soup made with leeks, cream, stock, and shucked oysters is an all-time favorite and proves the point that simple is often better. But the simplest preparation is oysters on the half-shell, which is perhaps the best way to appreciate how local conditions shape these bivalves. And when I take my seat at the oyster bar, I’m thinking specifically of oyster flavor and texture. Oysters thrive where fresh and salt water mix, conditions that make Galveston Bay suitable for numerous oyster reefs. The Bay’s shape and in-flowing rivers means that salinity, temperature, depth, and currents change from point to point. These highly localized conditions within the Bay can produce two seemingly different oysters harvested only miles apart. A Pepper Grove Reef oyster from East Bay may taste bright and salty, while the Lone Oak oyster from nearby Trinity bay can have a creamy texture and a briny sweetness. These local conditions also shape the shell’s surface (smooth or ribbed) and the color and tenderness of the plump morsel inside. What this all means is that Galveston Bay produces as many oyster varieties as it has reefs. For foodies and oyster lovers, this is something to celebrate. Two years ago, I had the opportunity to work in partnership with the Galveston Bay Foundation and Tommy’s Oyster Bar to draft a map illustrating the location of reefs in the Galveston Bay. At the time, GBF and Tommy’s were organizing a public benefit and oyster tasting to improve awareness of the Bay as a vital (yet threatened) ecosystem and to draw attention to the culinary potential sitting just beyond the docks. The oysters to be tasted were harvested by Jeri’s Oysters, a fixture in Chambers County where they have managed oyster leases for decades. Mr. Tom Tollett, owner of Tommy’s, worked with Jeri’s Oysters to hand select oysters from a dozen local reefs. Back at the oyster bar, the half-shells were organized by reef into ice-filled bins. I confess to having some skepticism about the entire exercise before the tasting, but it only took a few samples to become a believer. Words like briny, crisp, pungent, creamy, sweet, earthy, metallic, and nutty are used to describe the flavor profile of oysters. If this reminds you of wine tastings, you’re on to something. As with wine, local conditions influence the flavors of the oyster. The French word for the concept that flavor comes from geography is terroir (pronounced tear-wa). Over time a specific location develops a reputation for particular flavors and the location’s name—its appellation—becomes synonymous with foods from there. For oyster appellations, the delicacy cannot be separated from its point of origin. The oyster map identifies the reef appellations of Galveston Bay and it includes information like water depths, ship channels, wetlands, rivers, and landmarks. Fresh water inflows from the rivers are vital to the health of the Bay’s oyster population. The primary source of fresh water is the Trinity River, the San Jacinto River, and numerous coastal bayous and wetlands. 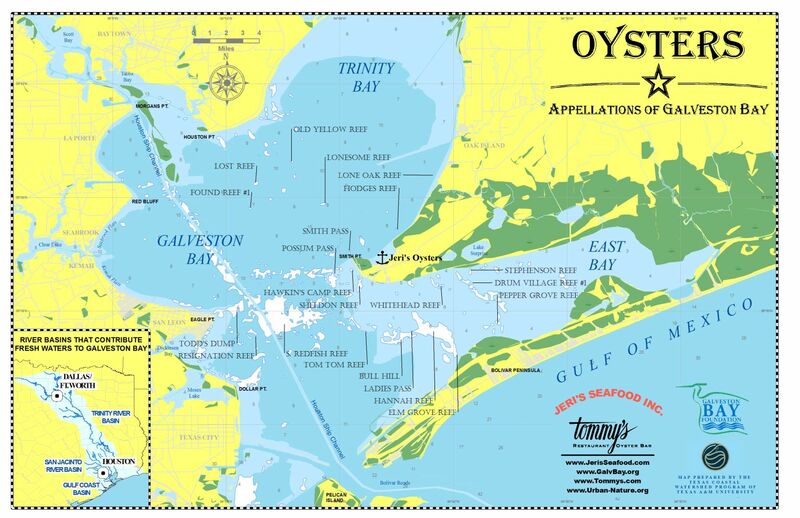 The oyster map is available for download and printing. A large five-foot by seven-foot version on the same map can be viewed at Tommy’s Oyster Bar while you enjoy a dozen Pepper Grove on the half-shell.